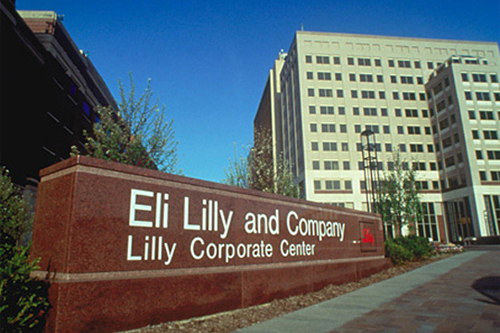 Eli Lilly has moved a step closer to filing for approval of its gastric cancer drug ramucirumab after reporting positive results in a phase III trial. Data from the REGARD study showed that ramucirumab (IMC-1121B) improved both overall survival and progress-free survival in patients with metastatic gastric and gastroesophageal cancers compared to placebo when given as a second-line therapy. Ramucirumab was originally developed by ImClone Systems, which was bought by Lilly in 2008 in a $6.5bn deal that focused on ImClone's colorectal and head and neck cancer therapy Erbitux (cetuximab) as well as a pipeline of other oncology candidates. This is the first phase III data to be available on ramucirumab, which is one of two ImClone candidates in late-stage testing alongside necitumumab for non-small cell lung cancer (NSCLC). The drug targets the same vascular endothelial growth factor (VEGF) pathway as Roche's $6bn Avastin (bevacizumab) but binds to a different molecular target. Whilst Roche's drug targets the VEGF ligand itself, ramucirumab targets one of its receptors (VEGFR2). REGARD compared ramucirumab and best supportive care to placebo and best supportive care in gastric cancer patients whose disease had progressed despite earlier treatment with platinum- or fluoropyrimidine-based chemotherapy regimens, a notoriously hard-to-treat population. The positive data "reinforces our confidence in the ramucirumab development programme, in which we currently have six phase III studies ongoing in five tumour types; breast, colorectal, gastric, hepatocellular and lung cancer," commented Lilly Oncology vice president Richard Gaynor. A second phase III trial in gastric cancer called RAINBOW has just completed enrolment and is comparing ramucirumab in combination with paclitaxel to paclitaxel given on its own. Ramucirumab has become more important to Lilly's future growth prospects given some late-stage pipeline disappointments. The company was forced to discontinue schizophrenia candidate pomaglumetad methionil in August, while Alzheimer's candidate solanezumab missed its targets in two phase III trials, although it remains in testing as an early-stage intervention. Analysts have predicted that ramucirumab could achieve sales of $600m a year in gastric cancer alone, with peak sales in excess of $2bn if it proves effective in other cancer types.